The English Toy Spaniel has always been kept solely as a companion. They have four different coat varieties, the Blenheim, Prince Charles, King Charles and Ruby. The Blenheim is white with red or chestnut markings, while the Ruby is a solid rich mahogany (a small white patch on the chest is allowed). 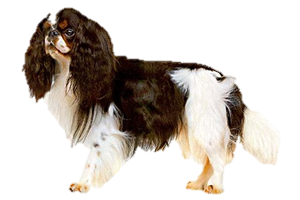 The King Charles is black with bright mahogany tan markings (may also have a white patch on the chest), and the Prince Charles is tricolor of white, black and tan. The English Toy Spaniel is known in England as the King Charles Spaniel, as they were a favorite of King Charles II. It was said that he spent more time with his dogs than affairs of the state. The black and tan variety was specifically kept by him (and still shares his name), although some paintings show black and white and solid black dogs as well. Their exact ancestry is unknown, the King imported some dogs from Spain in the 17th century, however dwarf spaniels had been present in England sing the 1600s. Some have suggested their ancestors came from Asia, but it is more likely that any Asian breeds would have been added at a later date during the Victorian era. Victorian breeders began to create dogs with extremely flat faces and it is then that dogs such as the Japanese Chin or Pug may have been added to the bloodline. During this period each color variant was considered a separate breed and the Prince Charles and Ruby (previously all red pups were destroyed) were created. Some still sought the traditional, long nose and continued to breed for this type. At Blenheim Palace, the seat of the Duke of Marlborough, red and white dogs had been kept since the 17th century. The 'new' dogs were so despised that they began calling their dogs Marlborough Blenheim Spaniel or simply Marlborough Spaniels in an effort to keep a distinct breed. However, in 1923 the Blenheim, Prince Charles, Ruby and King Charles all combined into the breed we know today, each color becoming simply a variant of one dog. Only a few years later there would be a movement to return to the long nose dogs, creating the Cavalier King Charles Spaniel.